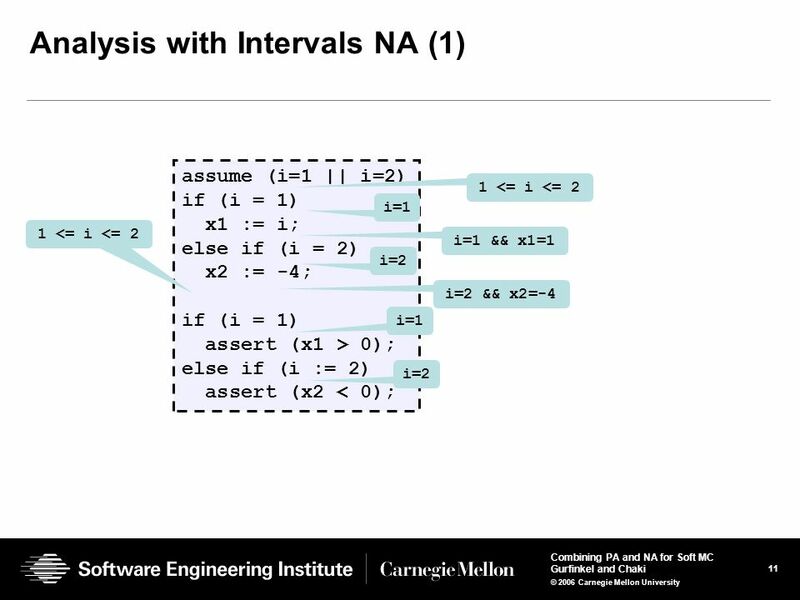 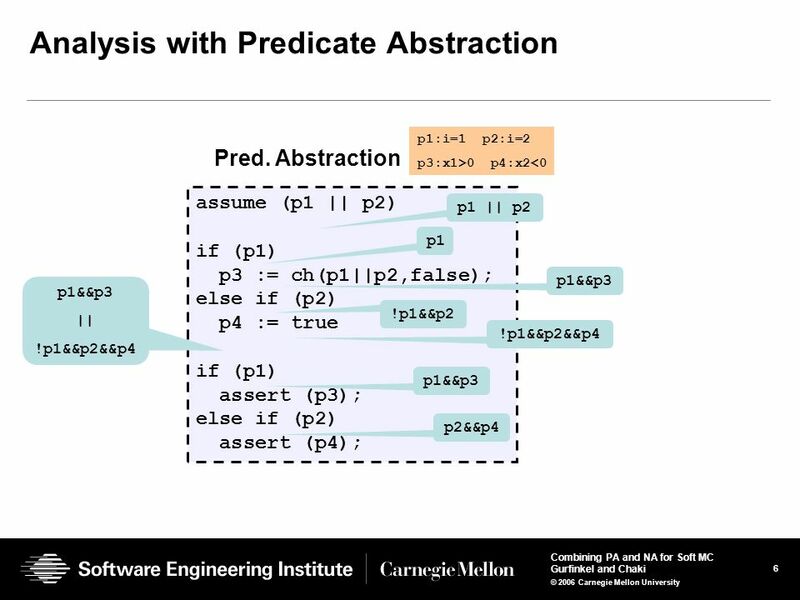 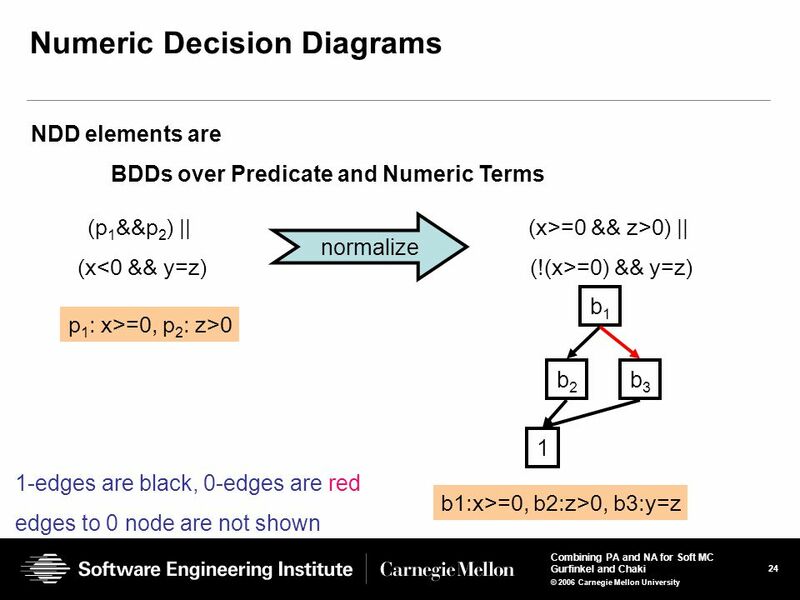 © 2006 Carnegie Mellon University Combining Predicate and Numeric Abstraction for Software Model Checking Software Engineering Institute Carnegie Mellon. 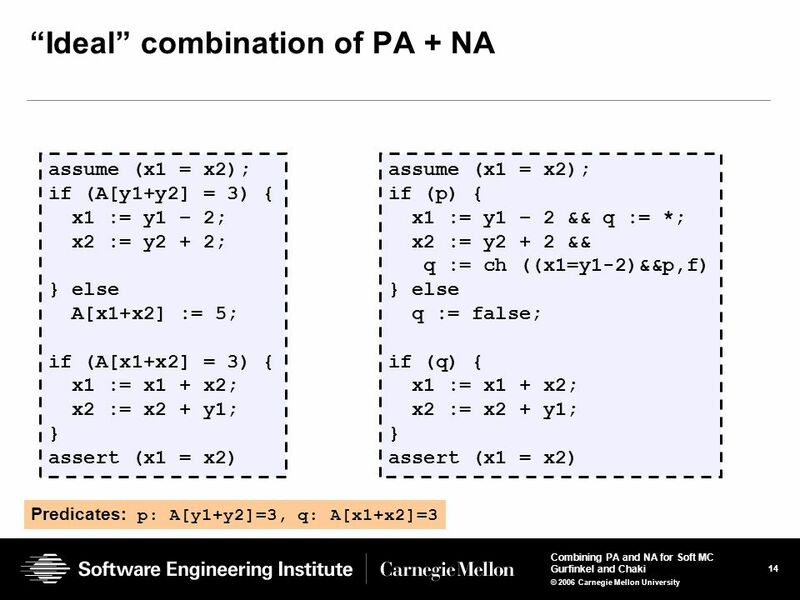 3 3 Combining PA and NA for Soft MC Gurfinkel and Chaki © 2006 Carnegie Mellon University Predicate and Numeric Abstractions Predicate Abstraction (PA) (e.g., SDV) Typical property: no lock is acquired twice Reduces program verification to propositional reasoning with model checker Works well for control-driven programs, and poorly for data-driven programs Numeric Abstraction (NA) (e.g, ASTREE) Typical property: no arithmetic overflow Reduces program verification to arithmetic reasoning Works well for data-driven programs, and poorly for control-driven programs How to combine PA and NA to get the best of both?! 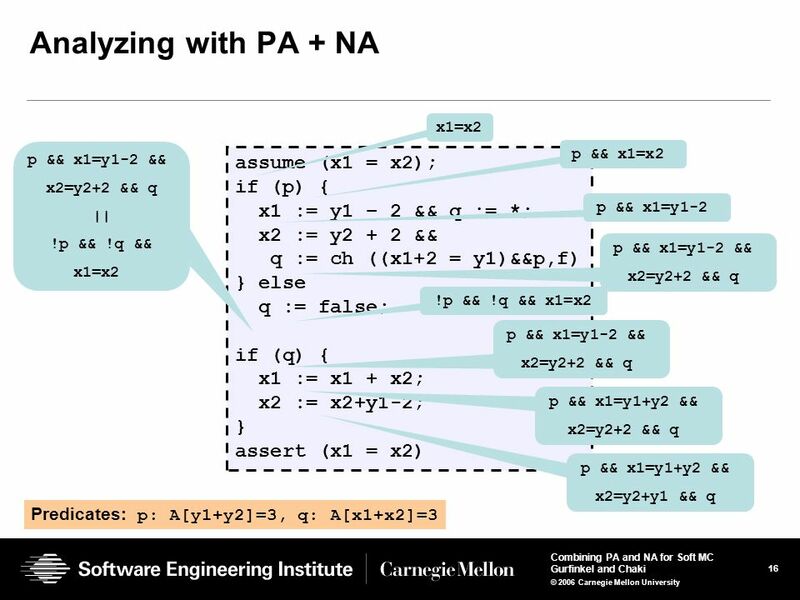 29 29 Combining PA and NA for Soft MC Gurfinkel and Chaki © 2006 Carnegie Mellon University Current and Future Work We are working on a more comprehensive benchmark suite Need automated abstraction-refinement for PA + NA In the current implementation, the abstract domain is treated as a black box. 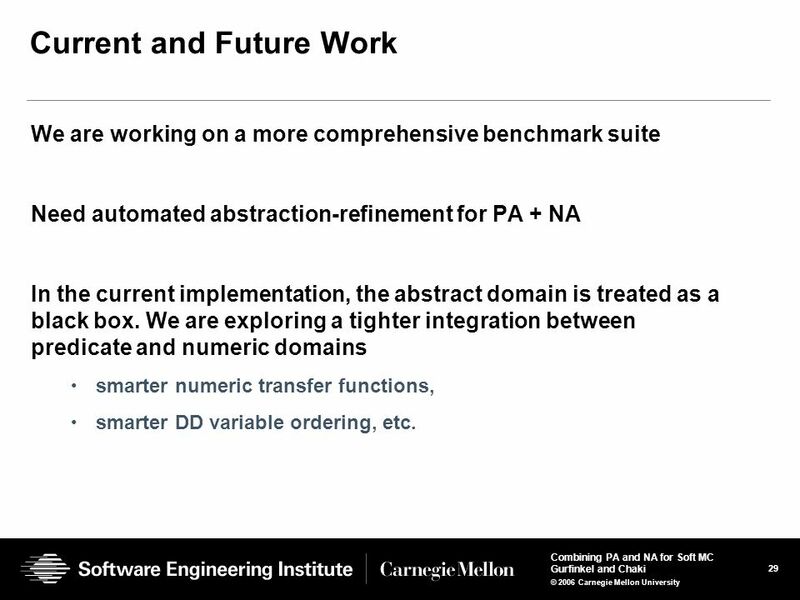 We are exploring a tighter integration between predicate and numeric domains smarter numeric transfer functions, smarter DD variable ordering, etc. 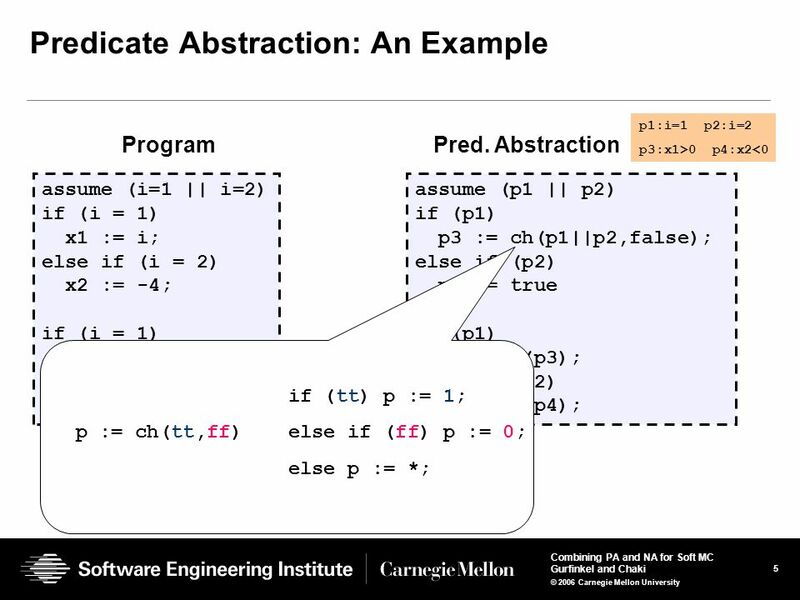 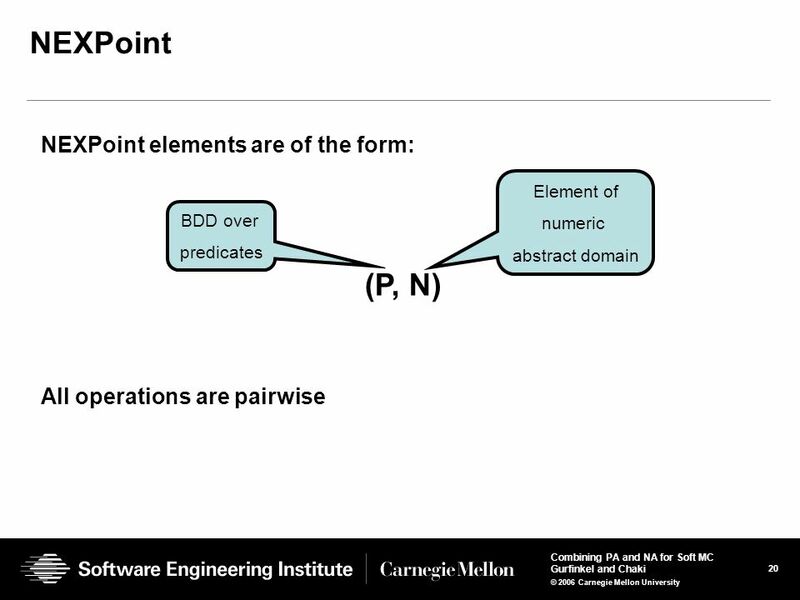 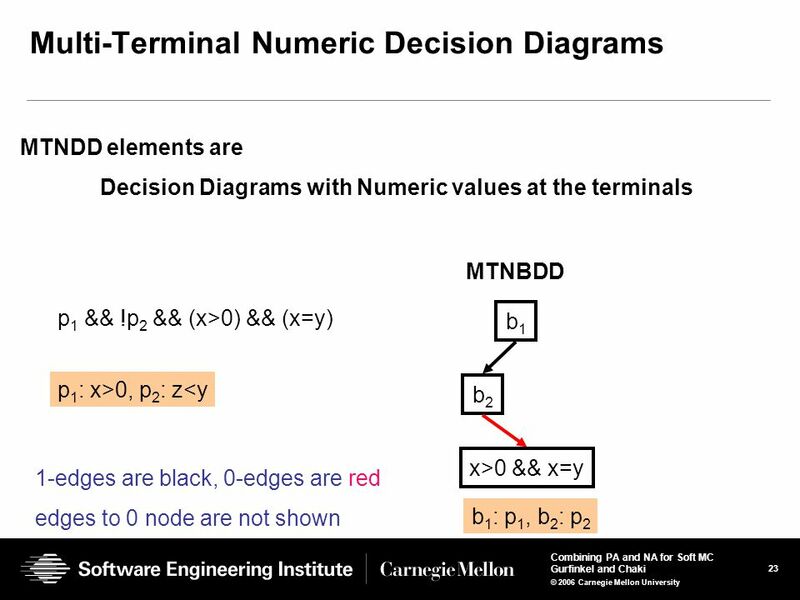 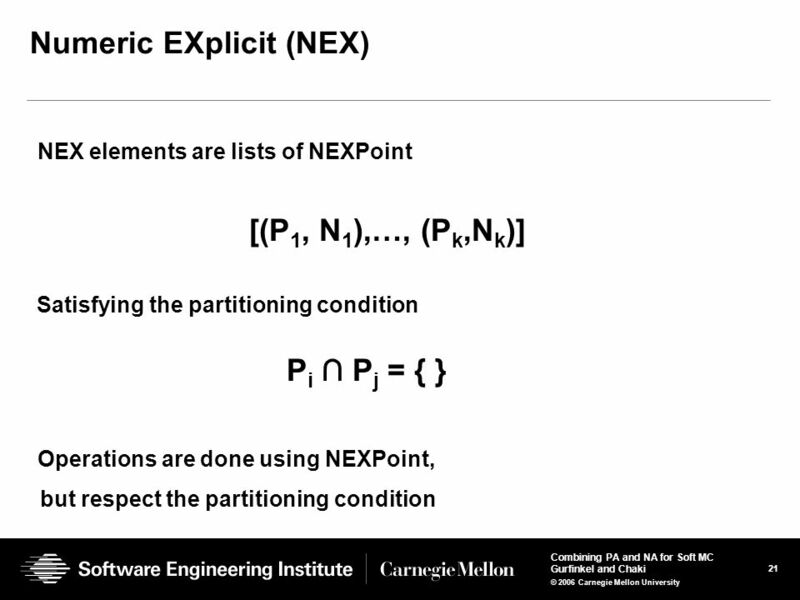 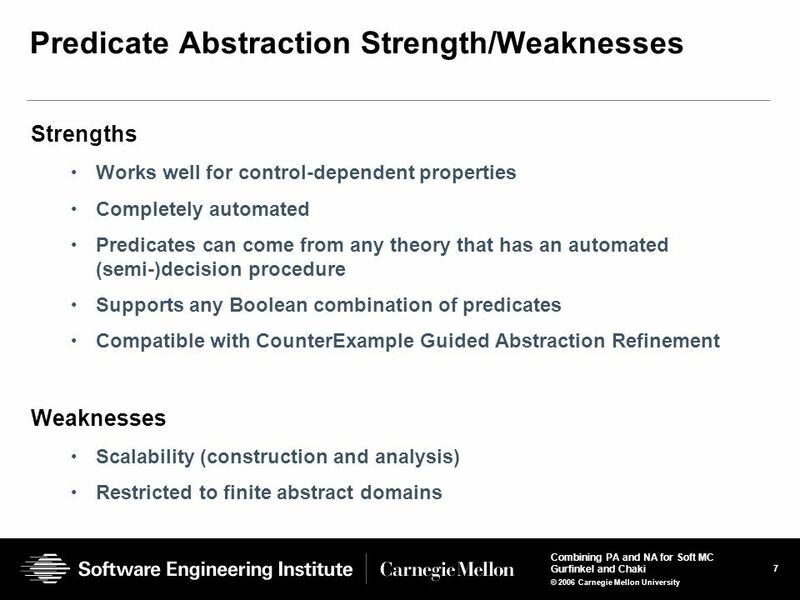 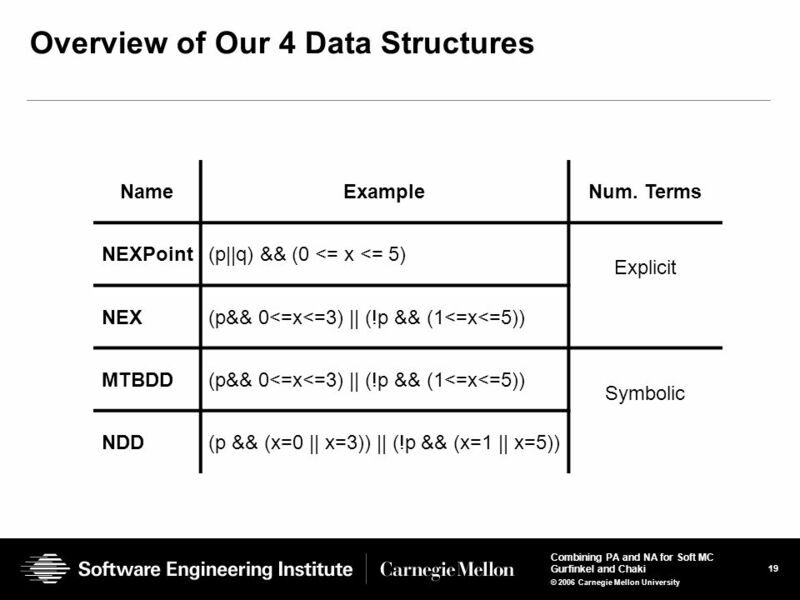 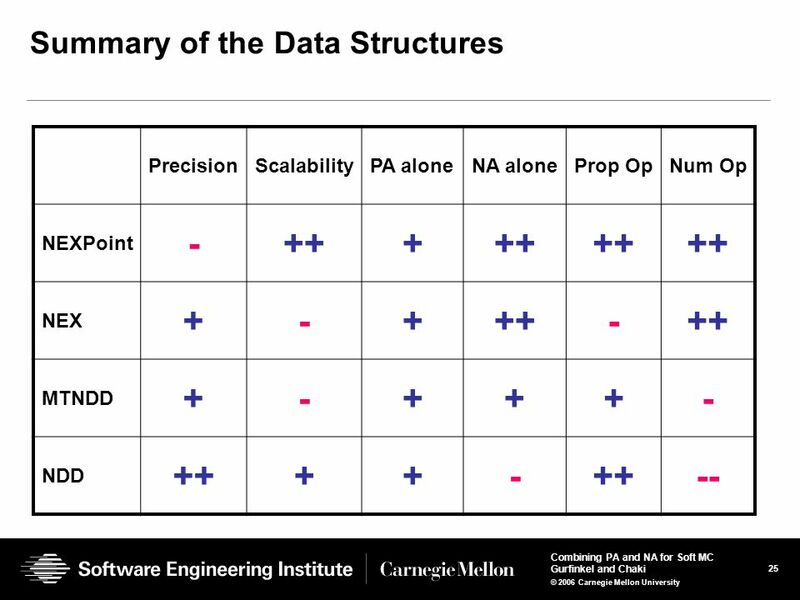 Download ppt "© 2006 Carnegie Mellon University Combining Predicate and Numeric Abstraction for Software Model Checking Software Engineering Institute Carnegie Mellon." 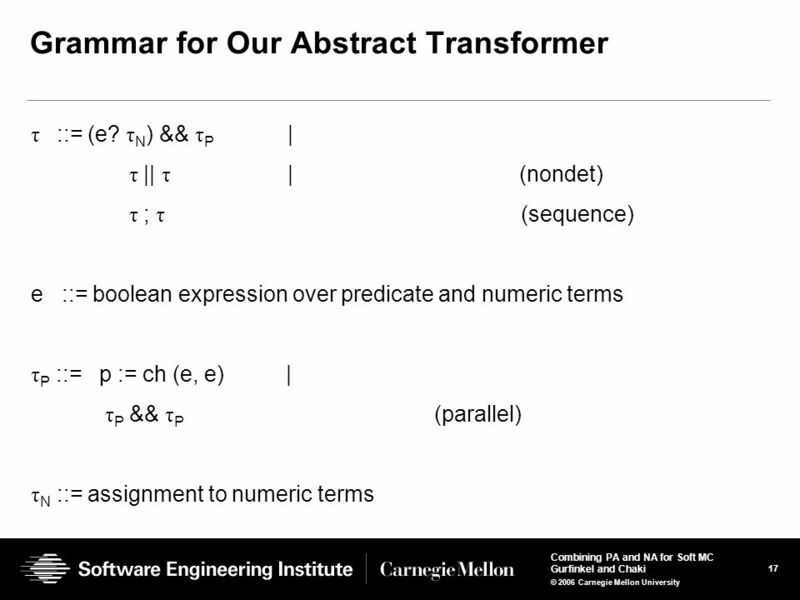 Logical Abstract Interpretation Sumit Gulwani Microsoft Research, Redmond. 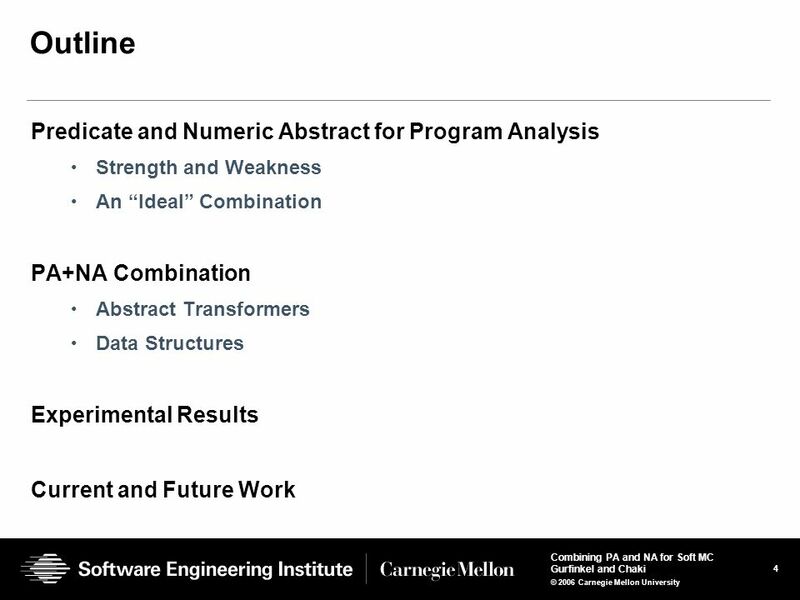 Using SMT solvers for program analysis Shaz Qadeer Research in Software Engineering Microsoft Research. 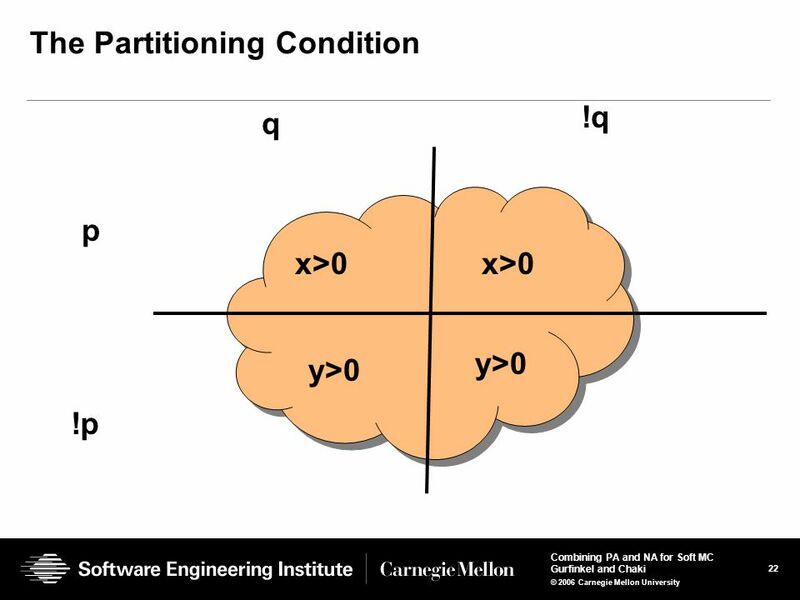 © 2013 Carnegie Mellon University UFO: From Underapproximations to Overapproximations and Back! 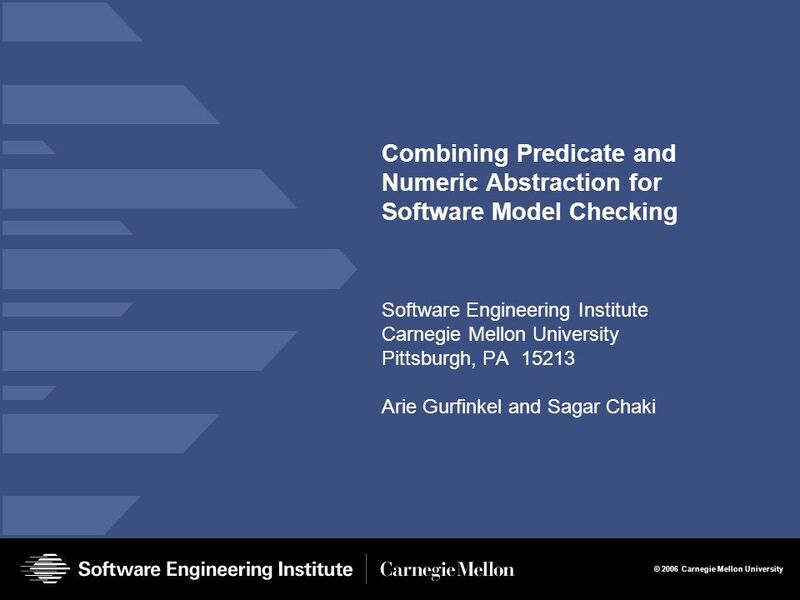 Arie Gurfinkel (SEI/CMU) with Aws Albarghouthi and Marsha. 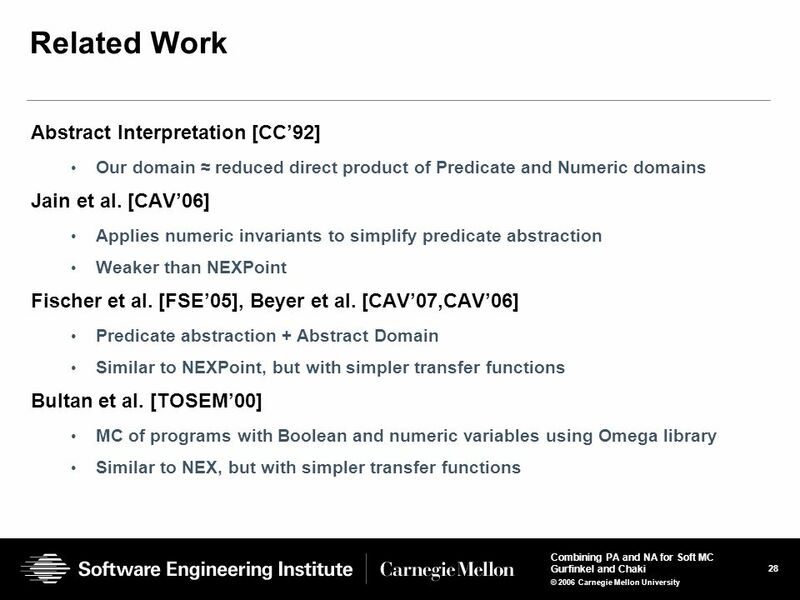 Verification of Evolving Software Natasha Sharygina Joint work with Sagar Chaki and Nishant Sinha Carnegie Mellon University. 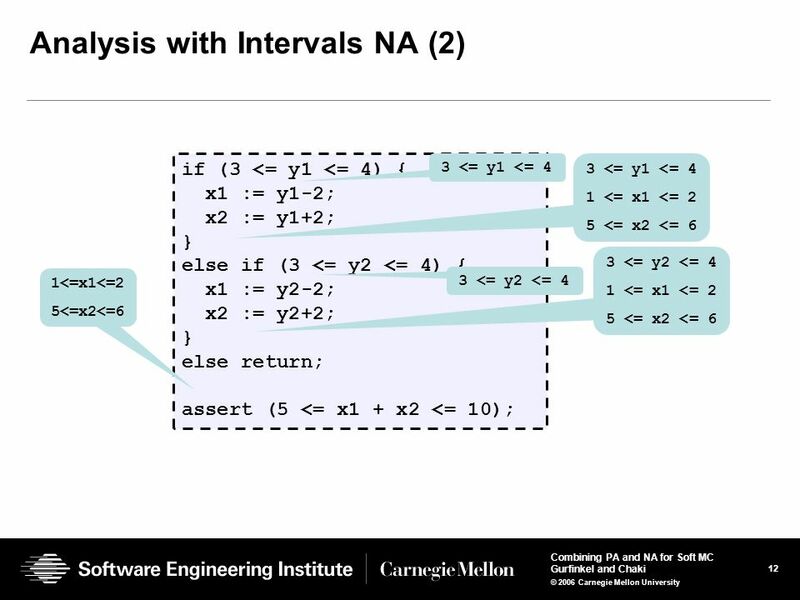 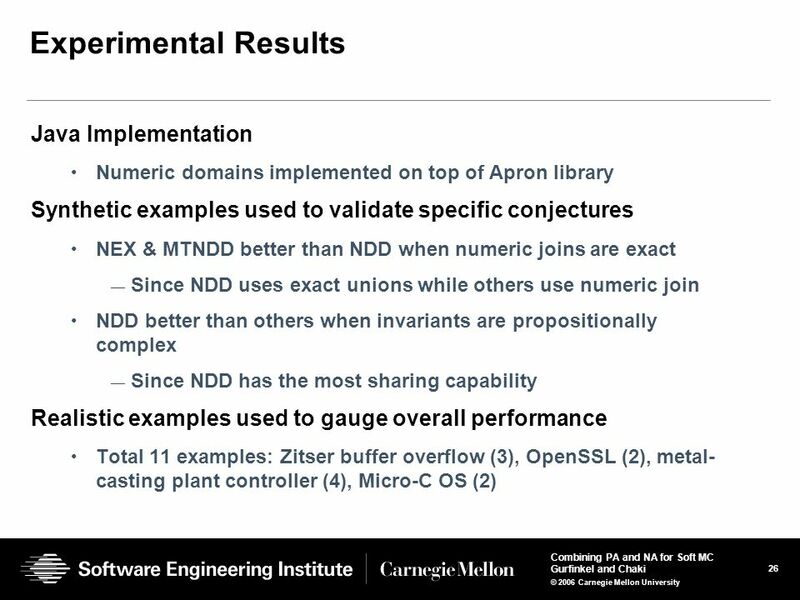 1 1 Regression Verification for Multi-Threaded Programs Sagar Chaki, SEI-Pittsburgh Arie Gurfinkel, SEI-Pittsburgh Ofer Strichman, Technion-Haifa Originally. 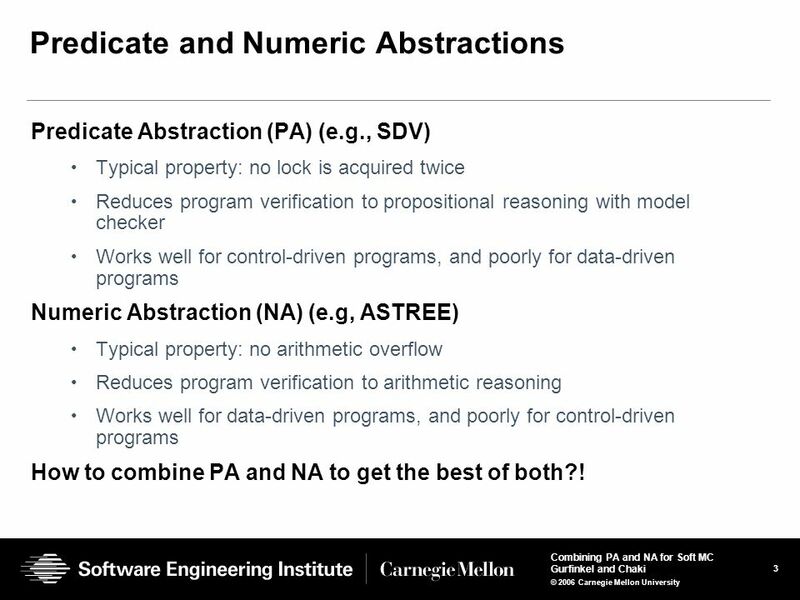 Lecture #21 Software Model Checking: predicate abstraction Thomas Ball Testing, Verification and Measurement Microsoft Research. 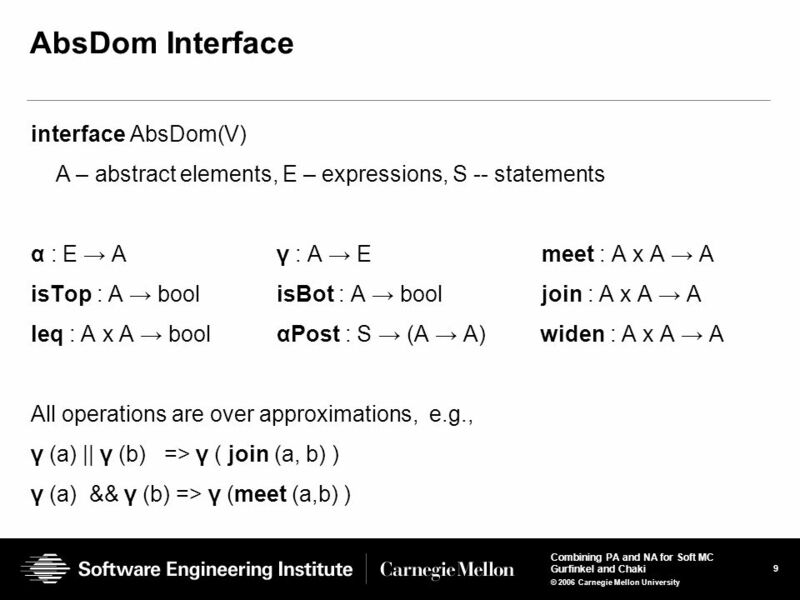 Formal Semantics of Programming Languages 虞慧群 Topic 5: Axiomatic Semantics. 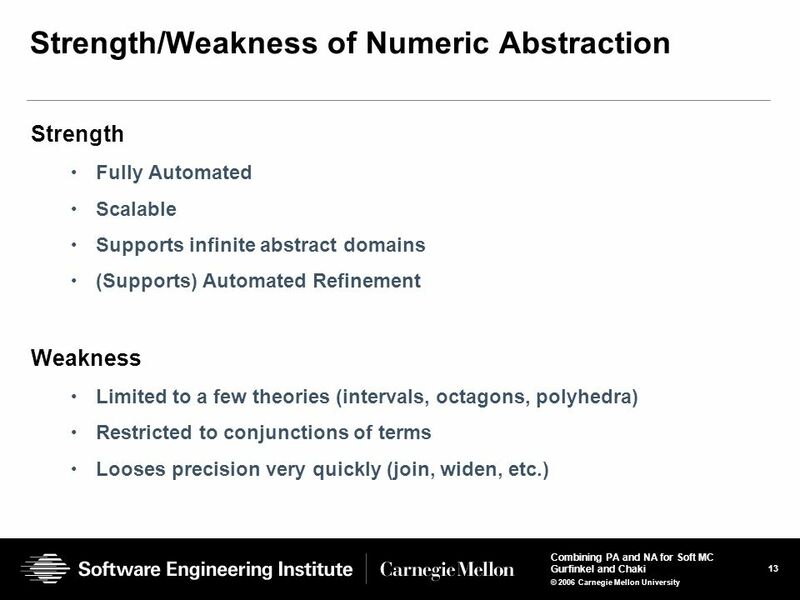 © Anvesh Komuravelli Spacer Automatic Abstraction in SMT-Based Unbounded Software Model Checking Anvesh Komuravelli Carnegie Mellon University Joint work. 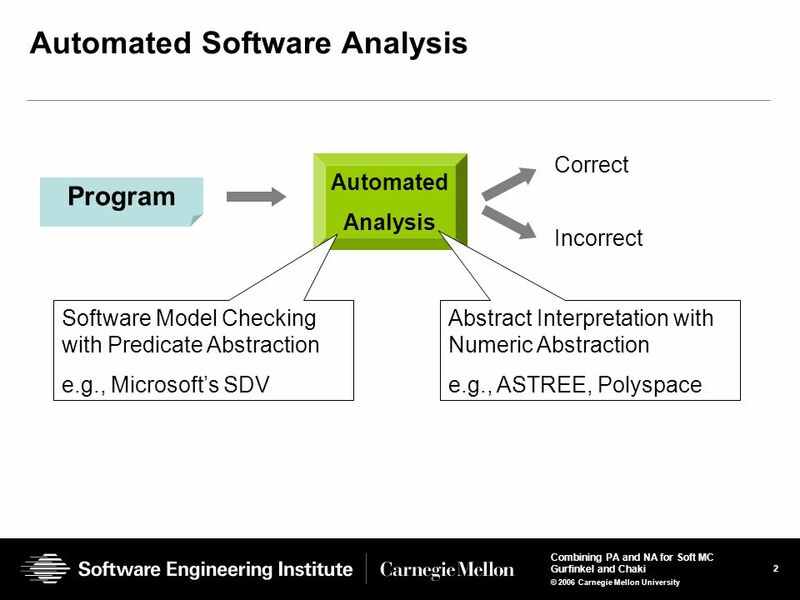 © 2011 Carnegie Mellon University SPIN: Part /614 Bug Catching: Automated Program Verification Sagar Chaki April 21, 2014. 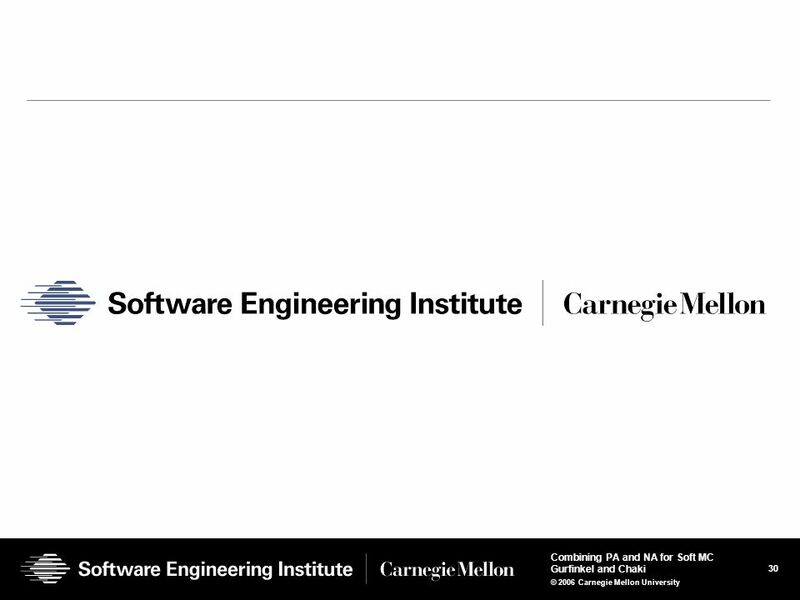 © 2012 Carnegie Mellon University Introduction to CBMC Software Engineering Institute Carnegie Mellon University Pittsburgh, PA Arie Gurfinkel November. 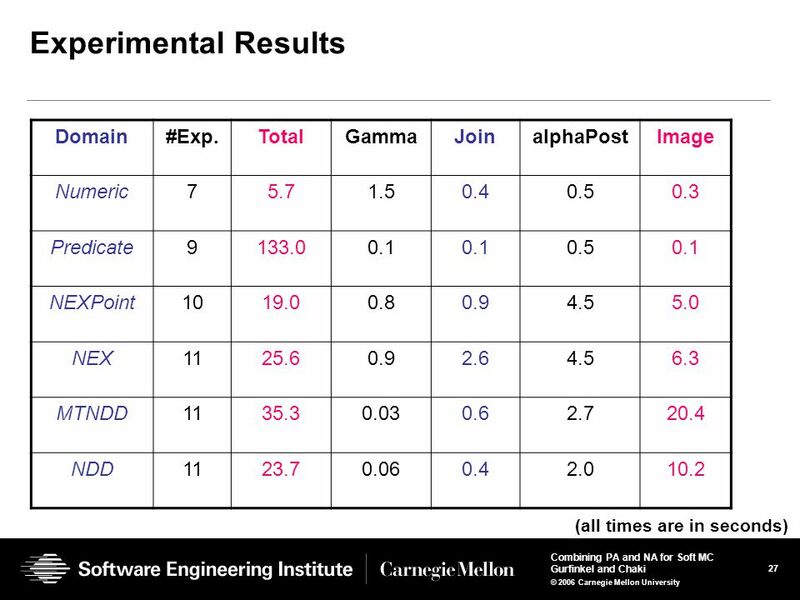 T h e G a s L a w s. T H E G A S L A W S z B o y l e ‘ s L a w z D a l t o n ‘ s L a w z C h a r l e s ‘ L a w z T h e C o m b i n e d G a s L a w z B. 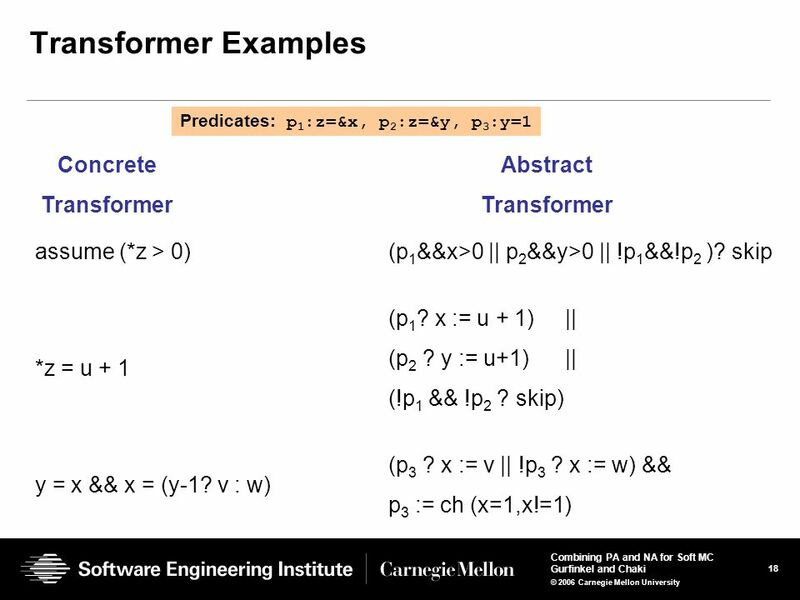 © 2011 Carnegie Mellon University B OXES : Abstract Domain of Boxes Arie Gurfinkel and Sagar Chaki Software Engineering Institute Carnegie Mellon University. 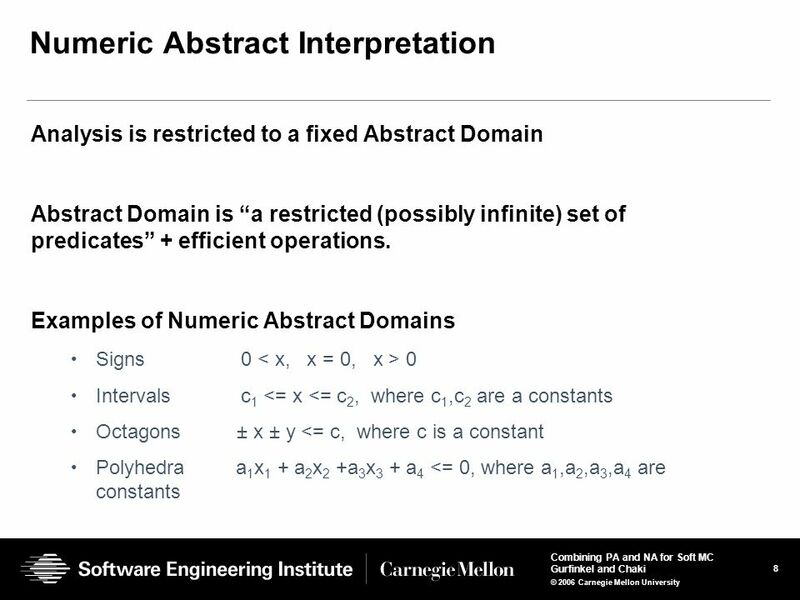 © 2010 Carnegie Mellon University B OXES : A Symbolic Abstract Domain of Boxes Arie Gurfinkel and Sagar Chaki Software Engineering Institute Carnegie Mellon. 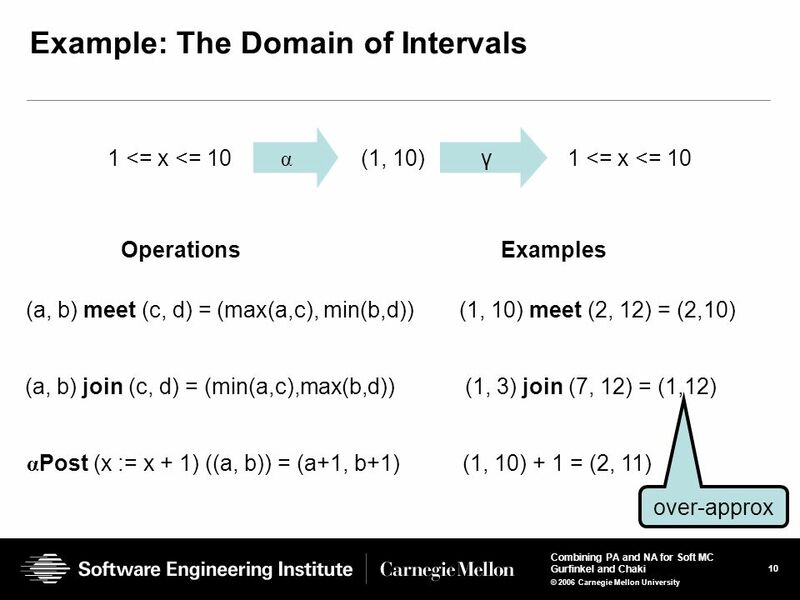 1 University of Toronto Department of Computer Science © 2001, Steve Easterbrook Lecture 10: Formal Verification Formal Methods Basics of Logic first order.